Whilst I’m waiting (somewhat impatiently) for my native bees to provide me with a little pot of honey, I thought I’d write about the most fabulous bee attracting plant I have thus far encountered. My volunteer gardening group planted some donated Pigface cuttings around a very ugly gas tank at our local hospital. We weren’t allowed to plant anything flammable on account of the bushfire risk, so Pigface seemed like a great idea. We stuffed the cuttings into the gravel with a small handful of partly rotted wood mulch, stood back, said a small prayer to the Garden God and then walked away. Well, this Pigface which we assume is Carpobrotus glaucescens, has turned out to be an absolute stunner. It seems to thrive on neglect, and grows enthusiastically in the worst conditions, but the thing that surprised us the most is its attractiveness to native bees. The record bee count in one flower is thirteen. They are almost impossible to photograph as they enthusiastically go about their business filling their pollen pants. 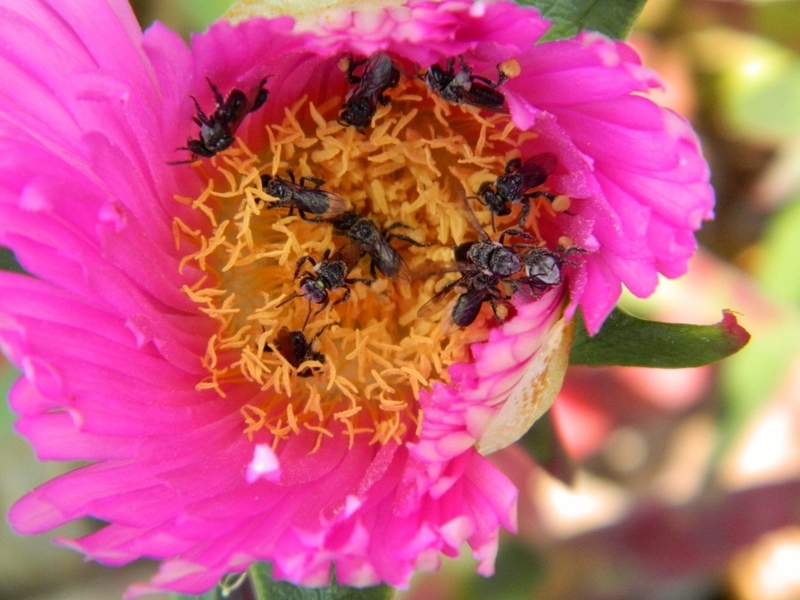 Thirteen bees – a World Record? I apologise for the wobble on this video, but it was taken on my iPhone, I didn’t have a tripod and I was kneeling in a bed of gravel (ouch!). Needless to say, I now have cuttings planted all the way up one side of my driveway, and I’ll be interested to see if the fruit that follows the flowers does indeed look like a pig’s face and whether or not they taste like salty apples as claimed. I have a feeling they might be an acquired taste. We’ll be growing some as soon as we get home!!!! 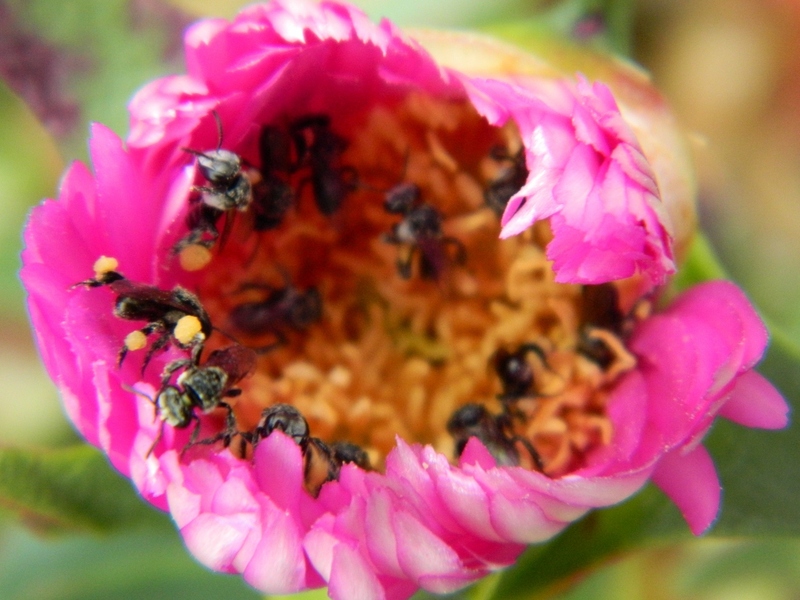 Wonderful photos of pigface- I’d never actually seen the ‘pollen pockets’ on bees! 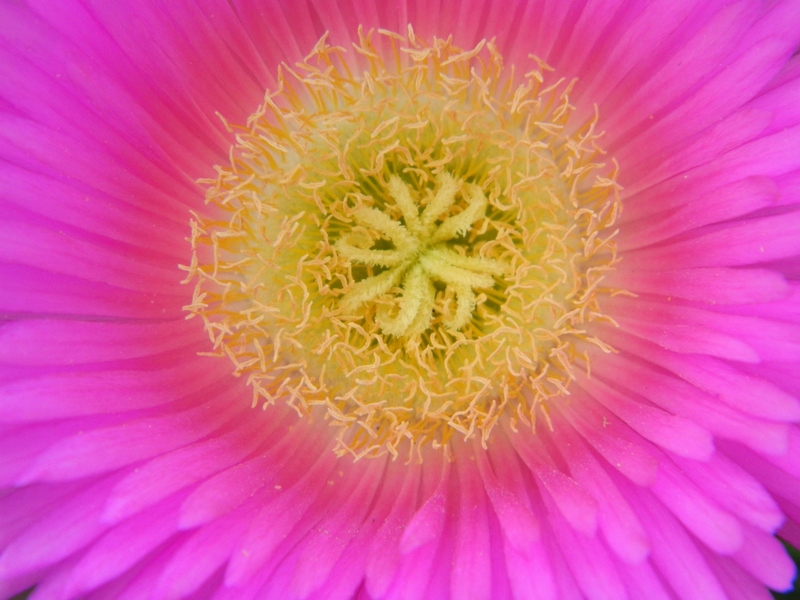 The flowers look a little like mesembryanthemum that we have here in England. Yes Mum remembered them as mesembryanthemum too, but apparently this plant has been moved into a new genus. Confusing.